Yesterday I jumped on a train and stepped off in a city that has been the site of plenty of murderous history in its time. I was in St. Albans. I was surprised to learn it was a city, being that it started and remained for most of it’s life a ‘one street town’. By that I mean, like many places in Britain, it grew up around a through road, and in this case the famous Roman road of Watling Street. The city was named after Saint Alban, the first British Christian martyr who was beheaded by the Romans for refusing to give up his new faith. Alban, originally a Romano-British pagan, was so impressed with the piety of a Christian priest that he sheltered from religious persecution that he cast off his pagan beliefs and became a Christian convert. When the Romans came calling, Alban offered himself up in the place of the other priest. As a result, when this was discovered, the Romans became so angry they beheaded him. Later, when invaders returned home to Rome, the Roman City of Verulamium became known as St. Albans. Before that, Boudicca, queen of the British Iceni tribe, led an uprising against the occupying forces of the Roman Empire. She and her tribe of warriors went on the rampage against the invaders attacking what is now called Colchester, London and St Albans. It took place in AD 60-61. Below the ground of these three towns archeologists have discovered a layer of carbon and ash. It is the remains from the sacking (burning down to the ground) of these Roman occupied centers. I was here, not to attack or rampage the place, but to meet up with author Robert Bard and his assistant Leslie Abrahams, to talk about the two battles from the War of the Roses that also took place on this historic site. 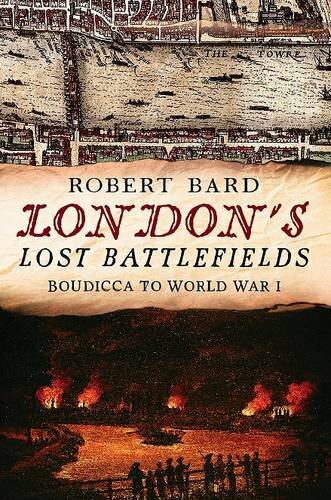 Robert’s book, London’s Lost Battlefields, explains that there were two important conflicts fought here. The first, on 22nd May 1455, kicked off the numerous battles of the 32 year feud between the most powerful families in England at the time. Each side, represented by the colour of a rose, was vying for right to be King. This war should have been called the War of the Car Parks; it is hard to believe that in an unassuming St Alban’s car park (one that Robert found a unique way of getting his car into – through the closed of bollards) opposite a pub, the first confrontation of the War of the Roses began. It would eventually lead to the death of Richard the Third and a burial in another car park in Grey Friars Street, Leicester. However, as you stand in the first car park, picturing how the Yorkists faced up to the Lancastrians for the first time, there is no official plaque or marker to tell the visitor of this important historical moment. A great amount of detail from the two battles that took place during the War of the Roses in St Albans has been recorded. There is plenty of gory descriptions by those that took part, and also from observers living in or visiting the town. You may walk up the high street, between St. Peter’s church, at one end, and the Abbey at the other, with a 15th century clock tower near the middle, and picture the carnage and death that was happening 558 years ago. Many of the original buildings remain standing. I am planning to return with my camera and make an episode of the Bald Explorer in the new year (2014) and tell part of that story. If you would like to help make this happen and would like to be one of the first people to enjoy this episode, before it becomes broadcast on the Community Channel, then please make a donation on the right hand side of the BE website. Without out your support these important programmes, which incidentally are not funded in any other way, cannot happen. Thanks very much.